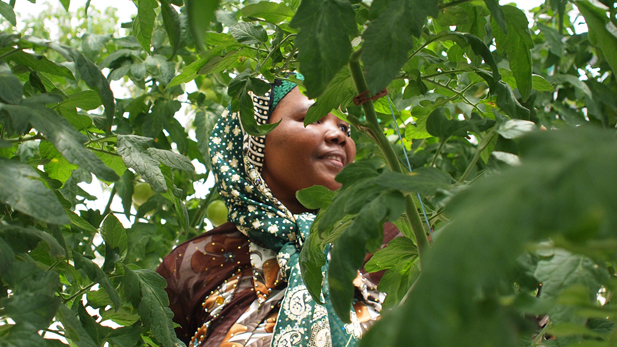 / Modified oct 3, 2012 12:36 p.m.
Marian Ahmed harvests tomatoes with the Iskashitaa Refugee Network. Ahmed is a refugee from Somalia who arrived in the U.S. more than eight years ago. When Barbara Eiswerth came back from Africa, all she saw was waste. 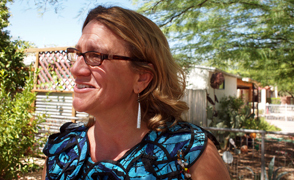 Walking the streets of Tucson, she found sidewalks littered with oranges, figs and pomegranates—the unharvested yield of people’s backyard trees. Having worked as a researcher in the impoverished villages of Malawi and witnessed hunger firsthand, Eiswerth couldn’t stand by and watch the food go unclaimed. Scientist Barbara Eiswerth founded the Iskashitaa Refugee Harvesting Network in 2003, after graduate fieldwork in Malawi made her acutely aware of how much food is wasted in the U.S. So Eiswerth started doing something she’d trained to do in graduate school: making maps. With help from teens she recruited through a local high school, she scouted for friendly homeowners and productive fruit trees or garden plots. Then she mapped the unwanted bounty. 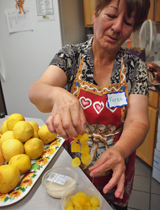 That year, her team redistributed the harvest from nearly 200 homes to local soup kitchens. Then, in 2003, Eiswerth met refugees from Somalia who had just arrived in Tucson, and was struck by the challenges they faced. Like refugees elsewhere in the country, Southern Arizona’s refugees encountered language and cultural barriers, few job opportunities and limited resources to pay bills or support their families. Many had left family members and friends behind, and found themselves struggling to adjust to a strange land with little support. Eiswerth wondered: what if the harvesting could help them? What if feeding people could create community ties too? And she decided to invite refugees into the gleaning. 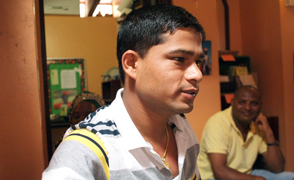 Bhakta Khadka, a refugee from Bhutan, shares his story with other refugees in the Iskashitaa Refugee Network office. Since then, the Iskashitaa Refugee Network has touched the lives of thousands of refugees, who volunteer with the network to glean and cook the city’s surplus food together. In the process, they develop some of the language and job skills they’ll need to build new lives. The refugees also form new cross-cultural friendships that help ease the loss of leaving their homelands. Iraqi refugee Faeza Hililian says she found a sense of community and belonging in Iskashitaa that made Tucson finally start to feel like home. Almost ten years after its founding, Iskashitaa has grown beyond Eiswerth’s dreams. Over its lifetime, the network has gathered about 400,000 pounds of produce and fed thousands with its harvests. It has also grown to include English and swimming classes for refugees, cooking classes for the Tucson community, sewing and craft circles and even catalog sales of the goods Iskashitaa refugees make. But Iskashitaa’s—and Eiswerth’s—mission is still simple: to fight injustice and make peace through food. This piece was produced in collaboration with the NPR program State of the Re:Union. Learn more about the Iskashitaa Refugee Network and other local stories by tuning in to the Tucson episode of State of the Re:Union at 3 p.m. on October 7, 2012, on NPR 89.1. Spotlight Session: Heather Hardy & Alvin Blaine How Sisterhood Helped Make a Superstar in "Always... Patsy Cline" Finding Common Ground with "One Small Step"